This morning I sat down with my calendar and my action lists, and made a plan for the next couple of weeks. The VONA manuscript has to go out by next Friday. The Drawgasmic piece can take a few days longer, till the following Monday. That’s not a lot of days to produce an artwork and up to 25 pages of prose! And of course I’ve got plenty of other work to do too, and this weekend is Mother’s Day, and the yard needs weeding desperately. So it’s going to be quite the balancing act between now and the 17th. I put in a good hour of writing before lunch, and thankfully it wasn’t at all painful. For someone with an awful lot of imagination, I’ve always had some trouble with fiction, so I’m really glad to see it seems to be flowing better than it used to. Or maybe it’s just that I’ve been brainstorming and planning out this work for months now. Anyway, I got through three scenes and I’ll try for another three before the end of the day. If I can keep things up at this pace, I’ll have the first draft done by Friday, and that’ll give me enough time to revise — or to start over completely, if I decide it’s not what I want to work on at the residency. After lunch, I pulled out some animal photos I’ve clipped from magazines, and began doing some drawing practice. I have an idea for my Drawgasmic piece that involves animals; if it goes well, it will be quirky and evocative, and if not, it’ll be cheesy and cutesy… which means, as with the writing piece, I want to give myself ample time before the deadline to scrap everything and re-do if necessary. 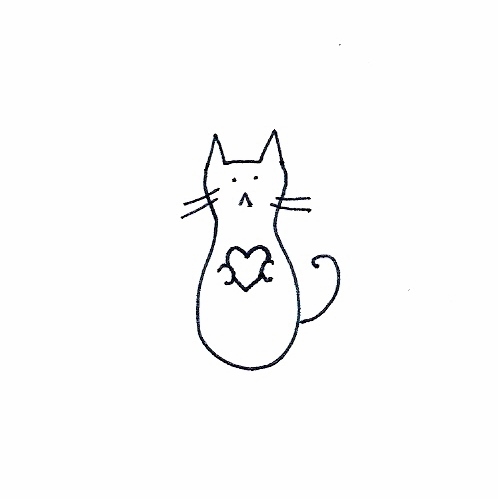 I’m not very practiced at drawing animals, except maybe cats and their kin, and even then it’s often just a recurring doodle I call Peanut Cat. If you ask me to draw something like a horse or a whale or a lizard, I draw something so ridiculous that to call it “cartoony” would be an insult to cartoons everywhere. So some practice is in order. Overall, I’m pleased with how these sketches came out. 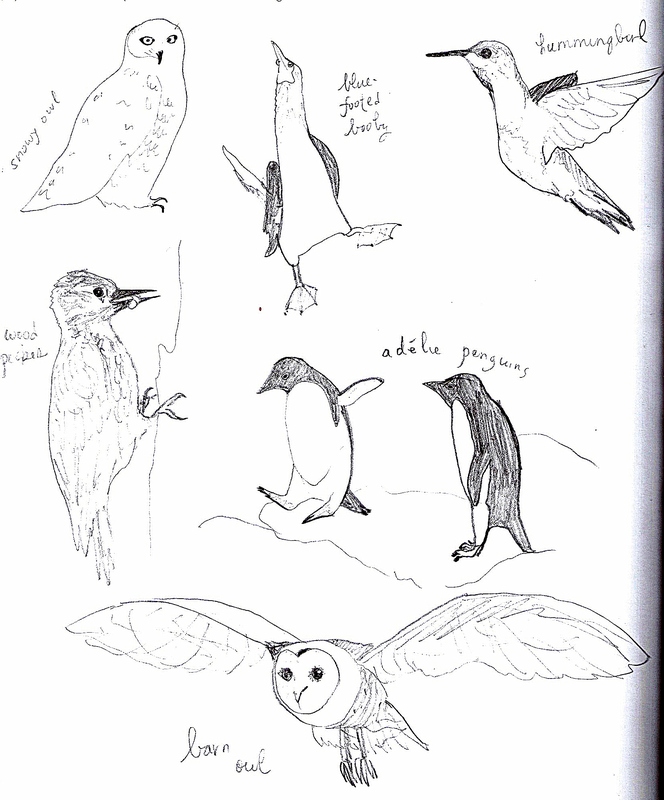 I learned a lot about birds just from drawing so many different kinds. It’s funny how our brains can store our observations without us knowing they’re there; it wasn’t until I started drawing these bird photos that I realized I’ve actually observed birds quite closely in the past. But I didn’t remember what I’d observed, until I had reference photos in front of me. There’s so much power within our observations and memories! The water creatures were trickier, probably because they cover such a range, from sea mammals to hard-shelled crabs to transparent jellyfish. With sea slugs and some of the fish, the coloration is nearly as interesting as the form, if not more so, but I’m sticking to plain pencil for now just to keep things simple. When I told Erik about my practice, he said, “You should draw prehistoric creatures. They’re so weird. 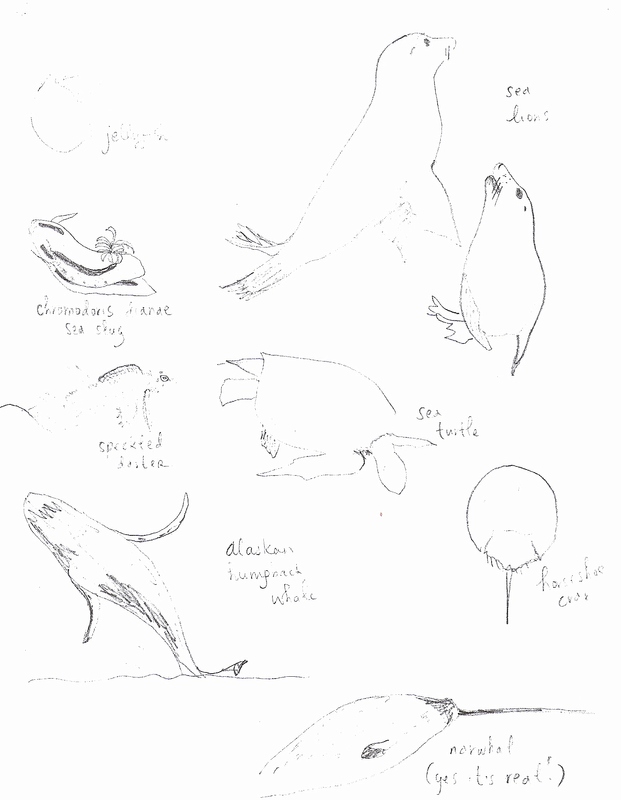 Also you should draw sea creatures. They’re just as weird.” Very true. Speaking of which: narwhals! Aahhh! Maybe I should toss my original idea and just draw a comic strip with narwhals talking to each other. I mean, narwhals! I’m feeling a little antsy to do some more crafting soon, and there are several personal projects I really want to get to, but I’m afraid I’ll have to put them off until after the middle of the month. I just can’t give up a handbag-long chunk of time right now when I should be working on my submissions. Ahoy, matey! Full speed ahead!